When winter rolls in, Mainers don't hibernate. We get out and celebrate all the great things there are to do in Maine in winter. We enjoy the rugged terrain and endless outdoor opportunities to fuel our adrenaline and make us feel alive. Lots of our visitors agree that winter is the best time to visit Maine. 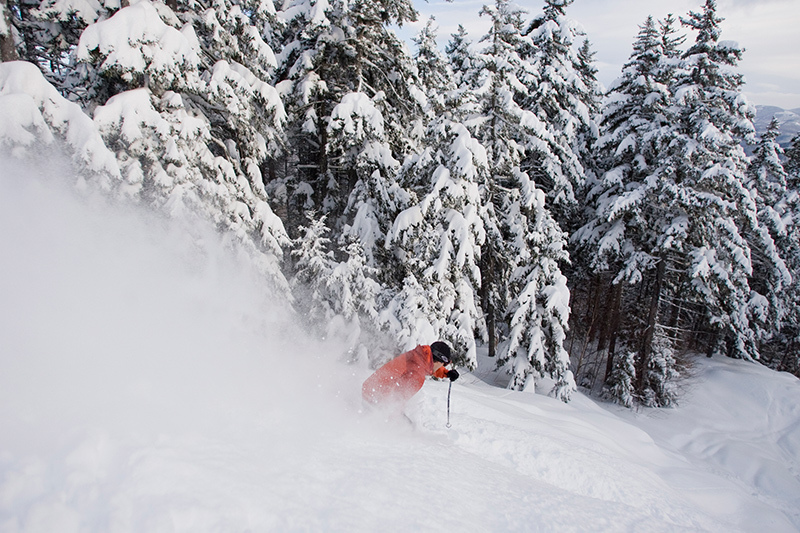 We welcome outdoor enthusiasts of all skill levels to partake in Maine's winter sports. If you don't have your own gear, there are outdoor outfitters to set you up with a snowmobile and ski resorts who'll rent you skis and teach you the basics. Then there's Maine's world-class cross country skiing, downhill skiing and snowboarding. The options are endless, from small local hills to big mountain steeps and backcountry glades with Sunday River and Sugarloaf (home to snowboarder and Olympic Gold Medalist Seth Wescott) in the Western Mountains. How many places can boast ski hills with ocean views? Welcome to the Camden Snow Bowl, home to one of the world's best toboggan runs. A slower, but no less invigorating way to explore Maine's winter wilderness is by cross-country ski or snowshoe. Imagine gliding quietly through balsam-scented forests, feeling the sun's warmth reflecting off the snow on a sparkling winter day. Perfection. 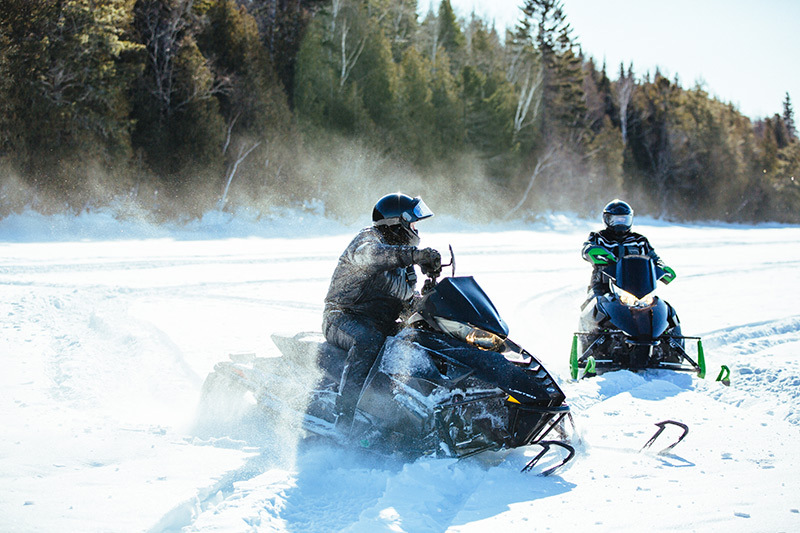 Thanks to abundant snowfall and an extensive network of winter trails, one of the most popular winter activities in Maine is snowmobiling. More than 14,000 miles of groomed trails mean you can ride uninterrupted from one end of the state to the other. Trail towns from Bethel and Rangeley to Jackman, Greenville, Millinocket and Madawaska have gas stations, lunch stops, and local snowmobiling clubs that maintain the local trails. And no overview of winter activities in Maine's outdoors is complete without mentioning ice fishing. Maine's many lakes may freeze over, but they don't clear out. 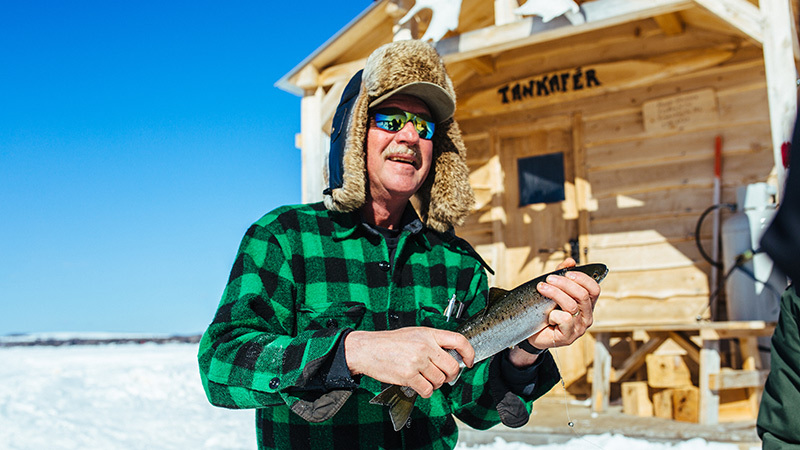 Almost every community hosts its own ice fishing derby, many geared toward the whole family. Quality family time and appreciation for the outdoors. Looking to make it a weekend trip? Whether you're visiting Maine's Lakes and Mountains region, the Kennebec Valley, the Highlands or Aroostook County, you'll find plenty of lodging options for when you're looking to warm up after a long day on the ice. 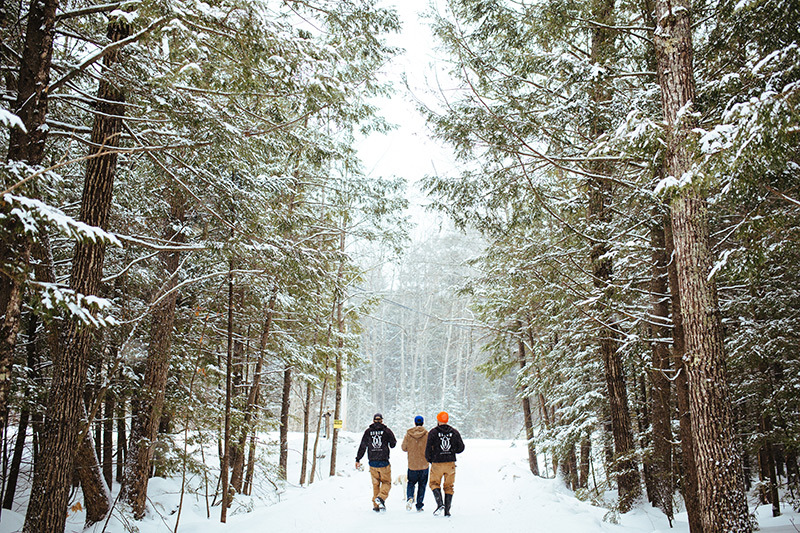 Almost any one of Maine's State Parks will welcome you with open arms in winter. Throughout the season, you can grab (or rent) your gear and enjoy snowshoeing, ice skating and Nordic skiing during Winter Family Fun Days at Aroostook State Park, Range Pond State Park and others across the state. A few more popular parks for winter activities include Bradbury Mountain State Park, Mt. Blue State Park and Baxter State Park. If you're looking more for Maine relaxation rather than Maine recreation, there's plenty to do indoors. Our favorite? Hole up in a public house, and sample the offerings of Maine's many craft breweries. Rockland's art galleries, Portland's James Beard nominee restaurants. Bangor's downtown stays vibrant all winter with eclectic restaurants, boutique shopping and a bustling casino. Plus, it's only an hour and a half from Moosehead Lake, giving you the best of both worlds. But chances are, if you're looking for things to do in Bangor or Portland or any other Maine town, you'll want to zip up the parka and head outside. Remember, no hibernating during winter in Maine. In January, various Winterfests host snow sculptures, scavenger hunts, ice carving and more. Camden also hosts the U.S. National Toboggan Championships, which are celebrated with ice carving, freestyle skiing competitions, beer tastings and an outdoor film festival. Up in Rangeley Lakes, there's the snowmobile club's annual Snodeo, a big party with scenic helicopter flights, marshmallow roasts, a chowder cook off and, of course, snowmobile rides. February's just as busy, with Moosehead Lake's Sno-fest — highlights include a 100-mile dogsled race – a must-see for dog sledding enthusiasts. If you like your festivals a little less chilly, Brunswick's Longfellow Days is a month-long literary celebration in February that includes community poetry readings, lectures, tours, dinners and films. And Ogunquit puts on a heck of a Mardi Gras, complete with a hat parade and hat party, crowning of a Mardi Gras king and queen, music and other general revelry. Once you've skied, sledded, skated, fished and celebrated to your heart's content, Maine offers plenty of places with a warm fire and a comfortable bed, from cozy cabin rentals to romantic New England inns and bed and breakfasts. Oh, and a bunch of great ski resorts, sporting camps and wilderness lodges. Get a good night's sleep. You'll want to do it all over again the next day. A unique way to see Maine in winter is to ski from The Forks down to Carrabassett Valley, staying in the boutique eco-huts maintained by Maine Huts and Trails, or along the Appalachian Mountain Club's lodge-to-lodge trail in the Moosehead Lake region. There are also several fully-furnished yurts available for rent in the backcountry. If you're not sure you want to head out on your own, you can always take advantage of guided tours with a Registered Maine Guide, ranging from half and full-day outings to extended trips of a few days or more. To get started on your Maine winter outdoor adventure, be sure to check out Visit Maine's Winter Activities page.